"I hate optimistic people. They bum me out with their upbeat attitude." Netflix has unveiled a trailer for a dark comedy called Girlfriend's Day, co-written by and starring Bob Odenkirk as a greeting card writer. 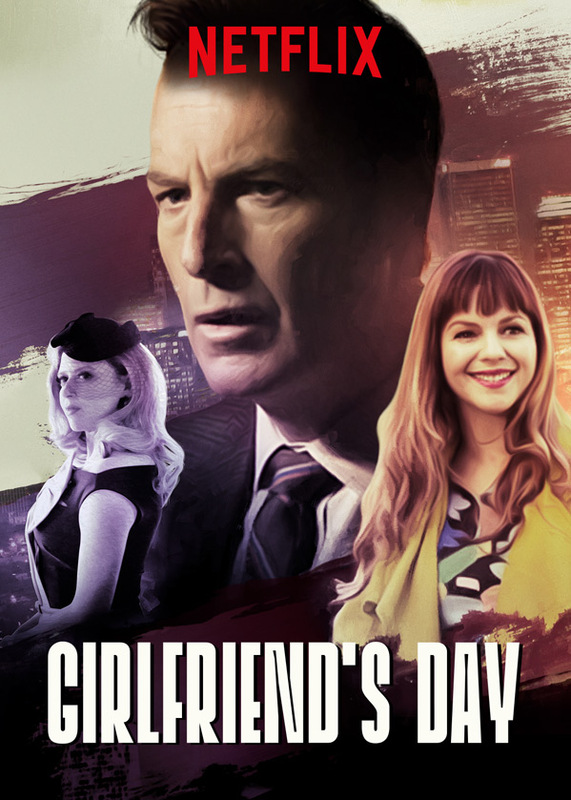 The wacky plot involves Odenkirk getting entangled in a web of murder and deceit as writers vie to create the perfect card for a new holiday: Girlfriend's Day. It's described as a "clever and quirky story about love, loss and the worst place to get a paper cut." The full cast includes Amber Tamblyn, Natasha Lyonne, Ed Begley Jr, Stacy Keach, Rich Sommer, June Diane Raphael, Andy Richter, Stephanie Courtney and Echo Kellum. This looks much darker and weirder than expected, but I'm not so sure about this one. Ever wonder who penned the perfect words to the Mother's Day card you sent last year? Or the hilarious birthday card you gave your best friend? A master of words, that's who. Meet Ray Wentworth (Bob Odenkirk), once a king of the wordsmith world, and now a down-on-his-luck romance card writer. In an effort to recapture the feelings that once made him the greatest, he gets entangled in a web of murder and deceit as writers vie to create the perfect card for a newly crowned holiday: Girlfriend’s Day. Girlfriend's Day is directed by Michael Paul Stephenson, of The American Scream and Best Worst Movie previously. The screenplay is written by Eric Von Hoffman, Bob Odenkirk and Philip Zlotorynski. Netflix will release Girlfriend's Day streaming online starting February 14th, Valentine's Day, this winter. Anyone curious? Looks awesome! I've loved Odenkirk for 20 years now, will definitely watch this. But actually a d*ck in real life. A friend of mine went to a book signing of the Mr. Show cast's "Hollywood Said NO!" and brought a hat or t-shirt from their "Hooray for America" tour to be signed. Odenkirk got pissed because he didn't buy a book, but David Cross and Brian Posehn thought it was awesome and didn't hesitate to sign it. My friend even bought a book on the spot to appease him, but he still refused. Soured my taste in the man. That's shocking news...I would have thrown the book on his head if he did it to me. I hate those signing events anyway. Reminds me of the scene from Galaxy Quest. I love this movie. Great cast. Great writing. Good comedies are so rare nowadays. The genre got plagued with the likes of Sandler, Amy Schumer and Seth Rogen. That poster in no way, shape or form represents that trailer! This looks hilarious and whimsically dark! I'm down! It looks like an interesting love story. Yeah, a bit bumpy along the way but why not? Reminds me of Punch Drunk Love. ...it looks like Saul Goodman got demoted.